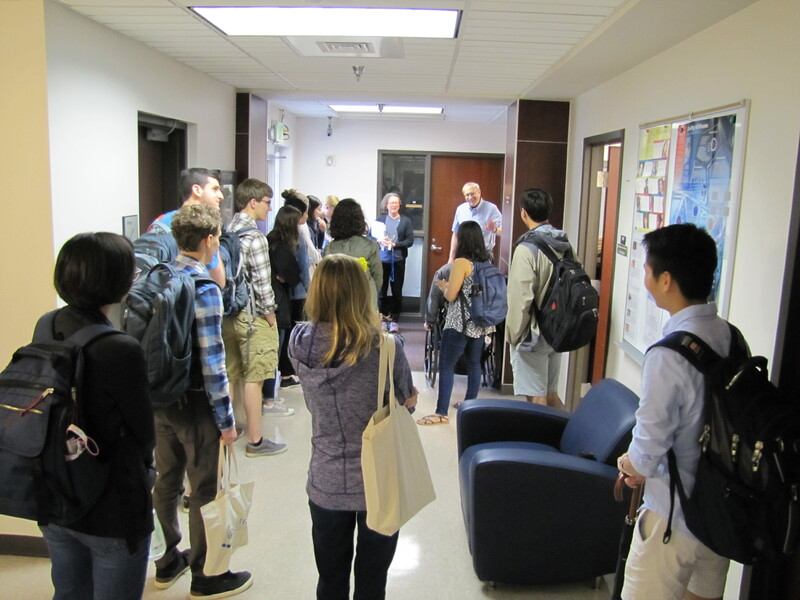 Undergraduates take the NIMBioS grand tour on the first day of SRE 2018. This year’s program marks the 10th year of SRE. The NIMBioS Summer Research Experience (SRE) program kicked off yesterday, celebrating a decade of providing students with opportunities to conduct research at the interface of mathematics and biology. Fifteen undergraduate students from around the country arrived at NIMBioS to begin the program, which runs for eight weeks. With NIMBioS postdocs and UT faculty, they will work on teams tackling a variety of topics, from modeling thousand cankers disease, management of feral cats, to topics related to hunting in tropical forests, using phylogenetics to understand cancer tumor evolution, and predicting mosquito abundance levels in response to the environment. To mark the first day, students and their mentors met to begin discussing their projects and what they will aim to get accomplished in the eight short weeks. Although the main focus is research, the students also receive training on mathematical modeling and software, careers, and graduate school, as well as experience working with the media. They also make time for field trips, dinner parties and other social gatherings. Nationally competitive, the NIMBioS SRE program typically receives more than 100 applicants. Participants have gone on to do amazing things, from publishing their research in academic journals, to winning competitions with their research, to pursuing doctoral studies in at the interface of math and biology. Participants receive a stipend, apartment-style housing, and travel support to Knoxville. More photos in our SRE Photo Album. This entry was posted in Education/Outreach, SRE, undergraduates and tagged Education, Education/Outreach, SRE, undergraduates. Bookmark the permalink.